The complete collection of Srila Prabhuapda's original books, conversations, letters, classes, etc. for the Amazon Kindle Wireless Reading Device. This is in the mobipocket format, suitable for the Amazon Kindle. 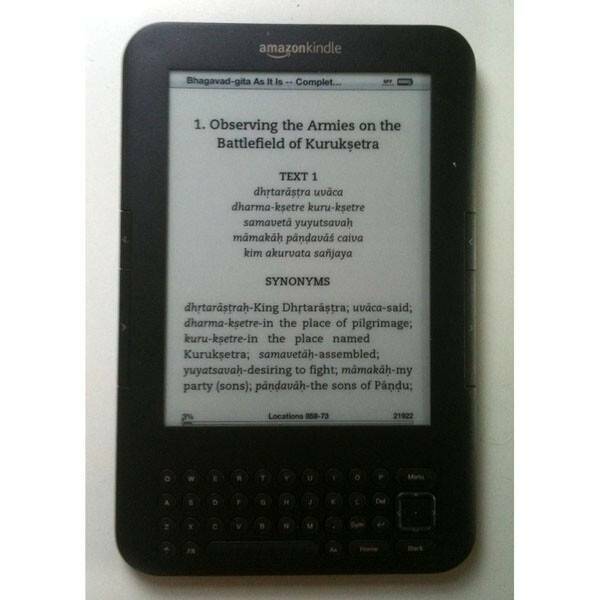 The Amazon Kindle enables you to comfortably read Srila Prabhupada's books anywhere. The Kindle is truly a revolution for reading Prabhupada's books. It has an amazing high-contrast paper-like display that does not draw any power at all from the batteries except when you are changing pages. So that means you can read Srila Prabhupada's books on the Amazon Kindle for up to a month on one charge of the batteries! The Kindle also provides an amazing search function which, while not as powerful as the folio search, it is far easier to use and incredibly fast and efficient. I was a bit of a "Kindle Skeptic" until some devotees requested us to provide Prabhupada's original books in a format that can be used on the Amazon Kindle. So I now have my own Kindle with all of Prabhuapda's books loaded up on it and can see that this is truly a wonderful way to read Srila Prabhupada's books. These Kindle Prabhupada Books include the Sanskrit diacritical marks and the Sanskrit words are fully searchable. If you type "krsna" into the Kindle search it will find all the Krsna's with diacritical marks for you. Experience the ecstasy of association with a pure devotee of Krishna through his Vani, his instructions. In addition to all of these books this Amazon Kindle download in mobipocket format contains complete transcripts of all of Srila Prabhuapda's lectures and classes, transcripts of all of his recorded conversations, and the complete collection of his letters to his disciples and others. How do I download the files to transfer to the Kindle? See this knowledgebase article here. Can I use the Read-to-Me feature with these books? Question: May I ask how many GB are needed for this download? Question: I can’t download the collection of Prabhupada book kindle edition, someone can help me ! !